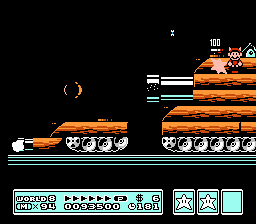 The Super Mario Bros 3 with warps movie is a definitive TAS: surprising glitches to improve speed and plenty of opportunity to showboat in autoscrolling levels. NES Super Mario Bros. 3 (JPN PRG0) "warps" in 11:03.95 by Morimoto. This is a historic movie, submitted and obsoleted before the creation of the database-based (and wiki-based) site engine, before July 2004. It was inserted into the database for a history revival project by Bisqwit in autumn 2006. When this video was first released on the Internet in mid-2003, its incredible quality of play became a phenomenon; since few people knew how the video was made, it was widely believed that it was played in real-time by an extremely skilled player. When Morimoto detailed the making of the run on his website (which can still be read here), many felt deceived and turned to criticizing the video's "illegitimacy" instead. During this time, the concept of tool-assistance was still mostly unknown, and people even went as far as claiming that Morimoto had constructed the movie in several years' time by performing video editing on every single frame of the WMV. While this video was not the first of its kind, it was the first to gain widespread interest, and contributed greatly to the popularity of speedruns in general. Ultimately, techniques improved and Morimoto's movie did as well. Michael Fried provided this faster version. The major improvement was taking a mushroom in the third stage. 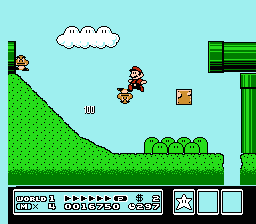 However, because he did not have the patience to do the bouncing 1up-chaining show in the autoscrolling stages, it was considered to be more "bleh", and it did not obsolete Morimoto's movie. 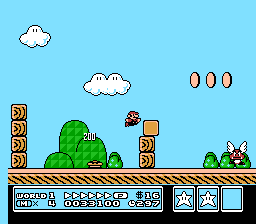 NES Super Mario Bros. 3 (JPN) "warps" in 10:58.92 by Michael F.
NES Super Mario Bros. 3 (JPN) "warps" in 10:53.52 by Genisto. Looking for the famous Super Mario Bros 3 timeattack by もりもと (Morimoto)? - is 10 seconds faster! - has better high score! - collects 5 coins more! It's sort of an improved hybrid of those two movies. Not only is it amazingly fast, it also manages to get 99 extra lives while waiting. NES Super Mario Bros. 3 (USA PRG1) "warps" in 10:34.55 by Genisto. 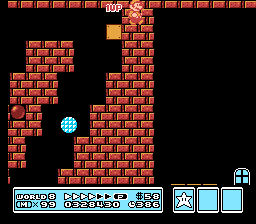 Once again, Genisto has surpassed the presumed limit of tool-assisted SMB3 speedrunning. 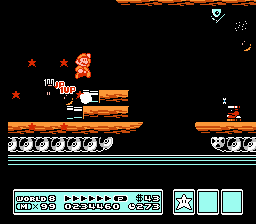 The differences between the Japanese and USA versions of SMB3 entail a few seconds of change, but most of this 19-second improvement's enhancement is because of Mario's passing through walls in the final fortress ― a trick that was discovered by Bisqwit. There are also some other new strategies that Genisto uses in this movie. Once again, of course, Genisto has acquired 99+ extra lives magnificently. NES Super Mario Bros. 3 (USA PRG0) "warps" in 10:29.05 by adelikat, Deign, Cardboard & JXQ. 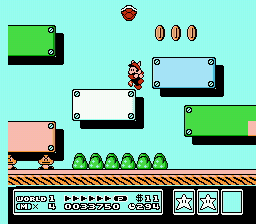 Surprise Super Mario Bros 3. improvement from nowhere! Apparently, the team of adelikat, Deign, Cardboard and JXQ had been working some time on this movie, which improves the previous movie by some 5.5 seconds (no small feat at this point), due to a wide variety of different improvements discussed in the submission message. And of course, a wadload of extra lives are again achieved in the mandatorily slow autoscrolling levels. For those that still prefer to see 99+ lives, the authors have also put together an alternate run that sacrifices time in order to gain those extra lives. But the team submission was not the last one in the line. In May 2009, Lord Tom and Mitjitsu submitted another improvement with a surprising route in the final castle, among other things. NES Super Mario Bros. 3 (USA PRG0) "warps" in 10:26.42 by Lord Tom & Mitjitsu. Ever since Morimoto published his legendary movie in mid-2003, the players at TASVideos have repeatedly made it faster and faster! This 96 frame improvement over the previous movie features a completely new route through Bowser's Palace, even more off-screen auto-scroller action and other technical improvements detailed in the authors' comments. Finally, Lord Tom and Mitjitsu are proud to announce that the new run once again acquires 99+ lives magnificently. The latest improvement to the warp run came three months later, by the same team together with Tompa. It incorporated a couple new stage strategies and a surprising final boss fight. NES Super Mario Bros. 3 (USA PRG0) "warps" in 10:25.6 by Lord Tom, Mitjitsu & Tompa. Ever since Morimoto published his legendary movie in mid-2003, the players at TASVideos have repeatedly made it faster and faster! Of course, there doesn't ever seem to be a stop for when it is fastest. This movie is 0.81 seconds faster than the previous movie. Most of the improvement comes from a trick that makes Bowser bounce much lower when defeated. For more details, see the run's comments. Check out the video of this being played on an actual console.